A the only working movie theatre in Kashmir, this is what a moviegoer endures: a frisking, a walk past sandbagged bunkers and a once-over by soldiers in body armour carrying assault rifles. But there are plenty of seats. Every day, Noor Mohammad, manager of the Neelam Cinema, stares at the empty rows, in a fruitless wait for customers in a land where the violence of daily life is more dramatic than on-screen fiction. The theatre can seat 750, but it is a rare day when there are more than 40 people for all three shows. None are shown at night—few people venture outside here after nightfall. Srinagar, the summer capital of Jammu & Kashmir, is a tough town. After Kashmiri militants launched an insurgency in 1989 that has left more than 68,000 people dead, this once-thriving city wilted. Protests shook the streets as Kashmiris demanded India allow the Muslim-majority region to become independent or join neighbouring Pakistan. Bombings became daily occurrences, and Indian soldiers flooded the Himalayan region. The Muslim militants ordered liquor stores, movie theatres and the handful of bars to close, saying they were vehicles of India’s cultural invasion and anti-Islamic. Many of the city’s eight movie theatres soon became something far more ominous. In the early 1990s, the Indian military converted most—including the Neelam—into makeshift army camps, detention or interrogation centres. Soon, places where audiences thrilled to Bollywood blockbusters became feared buildings, where witnesses say torture was commonplace. 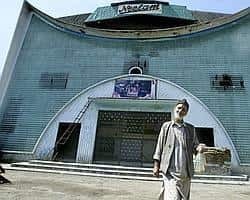 Two theatres—the Broadway and the Neelam—reopened in 1999 amid an official push to project the idea that life had returned to normal in Kashmir. But weary Kashmiris largely stayed away, and the Broadway locked its doors within a year. The Neelam stuck it out. It looks like a military installation. Coils of barbed wire surround the building, and gun-wielding soldiers stand guard behind sandbag bunkers. Few people come, fearing the possibility of a bombing or the wrath of the militants, who still oppose movie theatres. Employees, speaking on condition they not be identified, say the privately owned theatre gets a subsidy from the government, which still wants to make Srinagar appear normal. The theatre owner and government officials declined to comment. Mohammad counts one statistic as the most depressing: Since the theatre reopened eight years ago, not a single family has come together to see a movie.